Harbor Point Cabins has one new 5 bedroom Holiday house and two Cabins which are Eco friendly and Pet Friendly. Set on 70 acres of virgin native vegetation, wonderful for nature walks along the beach to the cliff tops. 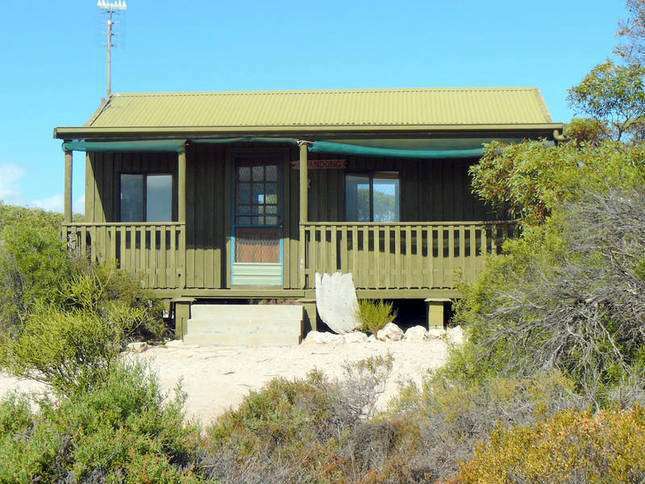 Perfect for those who enjoy bird watching and spotting the kangaroos meandering past. 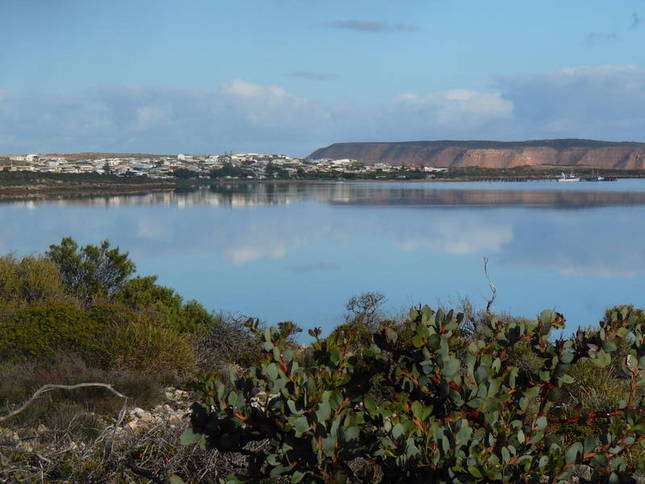 The accommodation maximizes the scenic views of the bay spanning from Venus Bay past the islands to Port Kenny, with wonderful sunsets and the lights of the two towns by night. 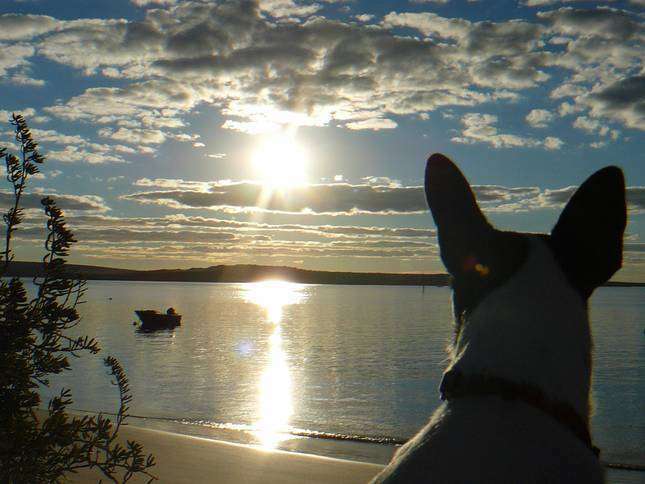 Only 4kms to Venus Bay jetty, boat launching ramp and swimming beach. Nightly rate is for 4 guest in Dolphin. Children under 5 years free, adults 16 years and above. Note : Pricing is subject to change, a minimum stay period and other conditions may apply. You should confirm pricing with the property owner. 7 nights for the price of 6 nights is offered. Please enquire and we will inform you of the current availabilities. DOLPHIN.......Come share your tranquil holiday at “Dolphin” the pet friendly, eco dream beach house. There is room for friends and family in this new 5 bedroom house. It contains 3 queen size beds, 1 double trio bed and 2 bunk beds...It has 2 toilets, 1 shower and laundry, new kitchen with dishwasher, microwave, reverse cycle airconditioner in the lounge with TV and Xbox 360. 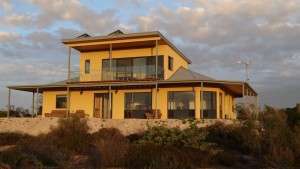 Upstairs has a BBQ, kitchen, table tennis table and balcony that captures the beautiful sunsets...It has 180 degree views of the bay, it is set on 70 acres of low lying bushland and has approximately 600m of coastline. 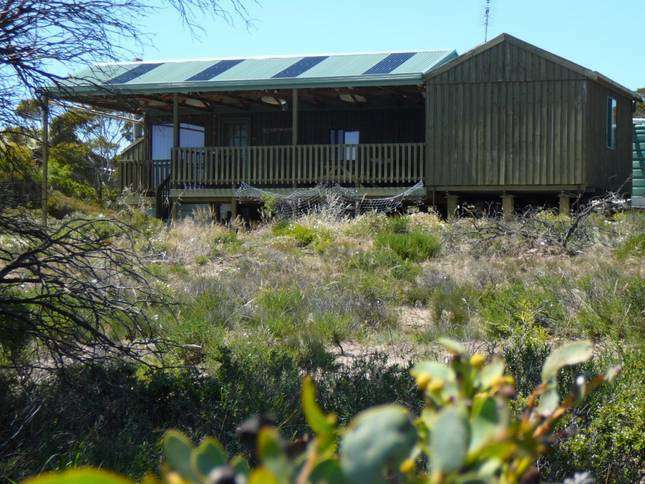 It is only 2 km from Venus Bay, so it is a quiet location but not remote or isolated...The power system is run totally on solar energy alone, with an off grid battery setup and auto start back up generator. It is run on rain water, thus only 1 water efficient shower to assist in keeping preserving water...........MELALEUCA.......Melaleuca is an open plan cabin with a small master bedroom containing an orthopedic queen size mattress and there is a semi detached bedroom which has 4 single beds and a double bed. There is a reverse cycle airconditioner and potbelly for heating. 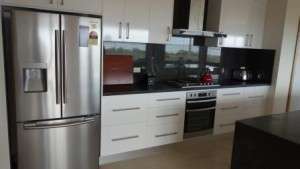 A family size stove, microwave, dishwasher, cooking utensils, crockery and utensils are all supplied. A gas BBQ is on the outdoor entertaining area which encapulates the stunning views and tranquility of the place, plus a common outdoor wood BBQ and campfire area. The shower and toilet have hot and cold rain water available. Melaleuca has a large electric fridge/ freezer. There is a TV/DVD and stereo system with CD player for your enjoyment. A laundry is available for those staying 7 days or more. It has a large veranda perfect for relaxing, if you need a low key, relaxing holiday, without the bells and whistles, then come and enjoy your tranquil holiday here...Plus it has a lockable dog kennel for your pets holiday...........QUANDONG.......Quandong cabin is a very affordable simple low key retreat perfect for singles and couples. 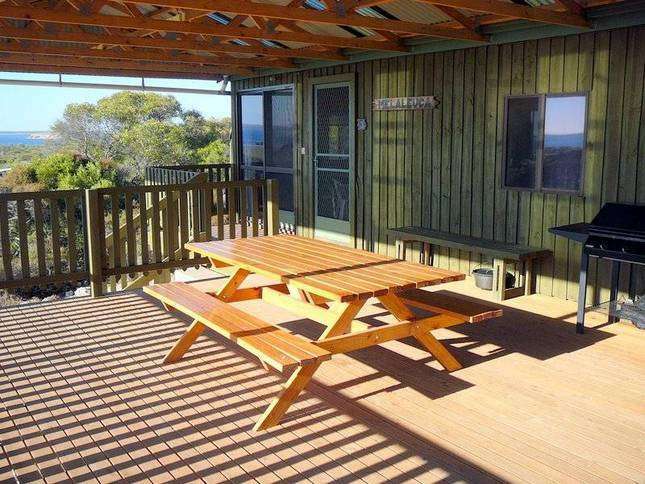 Quandong is a basic open plan cabin with a double bed mattress, bunk beds, kitchen, dining area, plus shower and toilet. There is an evaporative airconditioner for cooling and a new diesel heater for warmth. 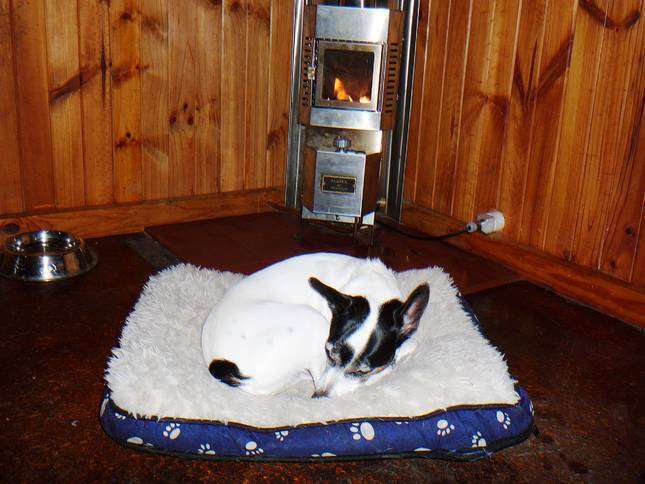 Quandong has a gas stove and oven, crockery and cooking utensils. There is a gas BBQ, plus access to a common outdoor wood BBQ and camp fire area. Hot water and rain water are available. Quandong has a fridge/ freezer. There is a TV, DVD, radio and stereo for your enjoyment. A laundry and second fridge/ freezer are available for stays longer than 7 days...Your pets are welcome to have a great holiday adventure with you, but please be aware that we encourage wild life and we ask that you be responsible pet owners...We do ask that you clean the cabin when you leave, cleaning equipment is supplied...We also ask that you show the property as much care and respect as we do, therefore if you are interested in hooning or partying please look else where.If you are in Quandong during a full moon, don’t forget to watch the moon rising over the bay from the back verandah and also the sun rises from the back veranda are magnificent.